Sorry, the dog ate my list! Better luck next meme. 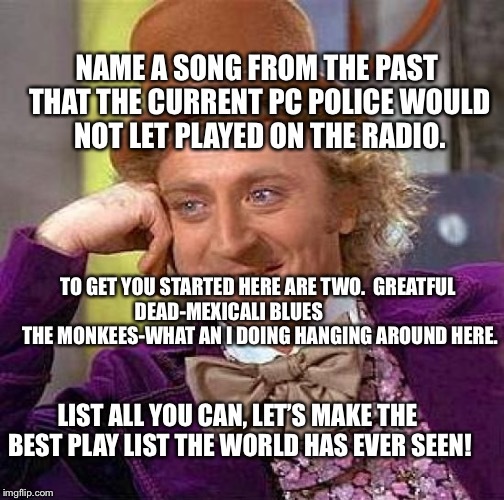 NAME A SONG FROM THE PAST THAT THE CURRENT PC POLICE WOULD NOT LET PLAYED ON THE RADIO. TO GET YOU STARTED HERE ARE TWO. GREATFUL DEAD-MEXICALI BLUES THE MONKEES-WHAT AN I DOING HANGING AROUND HERE. LIST ALL YOU CAN, LET’S MAKE THE BEST PLAY LIST THE WORLD HAS EVER SEEN!